During the weekend I wanted to take a closer look at beast, a http library proposed for boost. I planned to write an http client class, as thats something I'll need in some project later anyways. I've been looking at beast on and off for a few month now, and started by reviewing the documentation and examples to get a feel for the library it self. Let's take a look at the suspicious fragments in the LLVM code which PVS-Studio detected. LLVM developers, of course, will be able to understand if there is a bug here or not. I have to play detective. Looking at the code, I was thinking in the following direction: The function should read the opening bracket '<', then it reads the identifiers and commas in the loop. If there is no comma, we expected a closing bracket. If something goes wrong, then the function returns an error code. I reckon there was supposed to be the following algorithm of the function work (pseudocode). 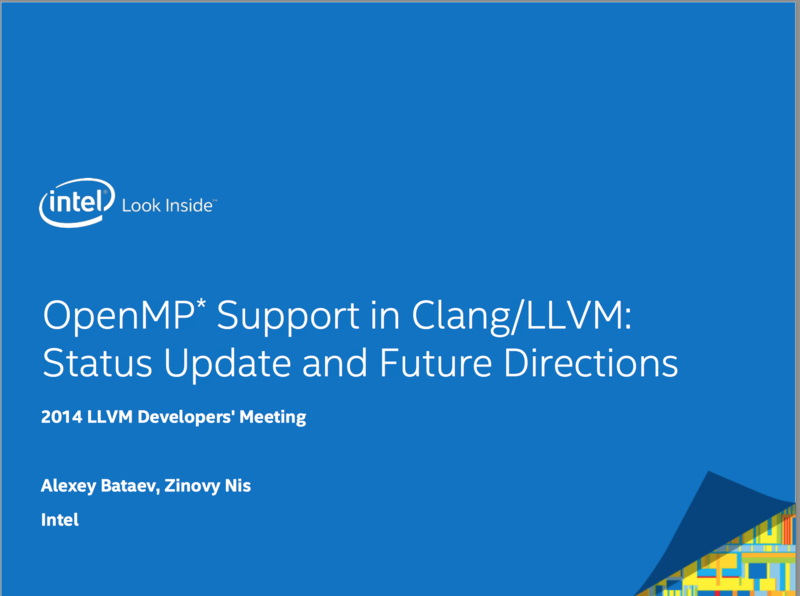 A status update for the work done on OpenMP for Clang/LLVM and future directions presented at the 2014 LLVM Developers' Meeting. The slides are also available here. OpenMP is a well-known and widely used API for shared-memory parallelism. Support for OpenMP in Clang/LLVM compiler is currently under development. In this talk, we will present current status of OpenMP support, what is done and what remains to be done, technical details behind OpenMP implementation. Also, we will elaborate on accelerators and pragma-assisted SIMD vectorization, introduced in the latest 4.0 edition of the OpenMP standard.